I truly believe that everything happens for a reason. Can’t explain how or why, I just know it to be true. The owner of our small company has recently been going month to month on our 3,000sf office/warehouse suite as she contemplated; renewing a long term lease, or look for a larger pad for our growing business. Two weeks ago, Mr. Landlord came in to advise that he had leased out our space and we had until May 1st to vacate. Hey, it’s just business. We wanted to stay close to our current site as our primary supplier is just down the block, so the search began. As if by fate, a nearly 6,000sf reasonably priced space will be available as of April 1st, less than a mile away. It will meet our current and future needs. At least for the next five years anyway. All the gears have now been put into motion to move our business in six weeks. As acquiring and outfitting nearly a dozen production/office spaces across North America, more than 600,000sf, was part of my previous life, I felt right at home with this challenge. Along with drawing a floor plan for a new space, my first order of business would have typically been to develop a detailed Microsoft Project file, often with hundreds of tasks, to ensure that everything stuck to the timeline. A weekly review of the subsequent Gant chart was expected. But I wasn’t about to go out and spend $500 on a current Project license for this six week project. I was further dismayed when Ms. Boss Lady came into the conference room on Monday with a four page convoluted list of tasks, printed from an Excel spreadsheet. I knew we were in trouble. 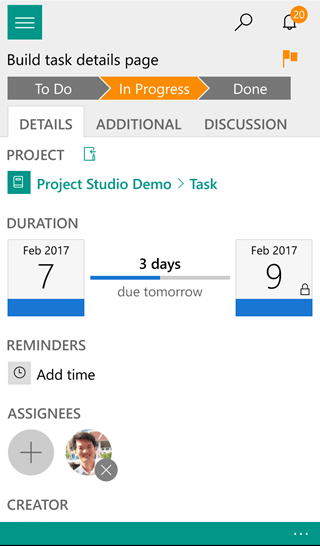 Then like magic, or that unexplained reason eluded to above, I read about a new app in the Windows Store on Thursday, Project Studio, a project management app that can sync across devices and multiple users. Better yet it was free (with basic functionality at least). 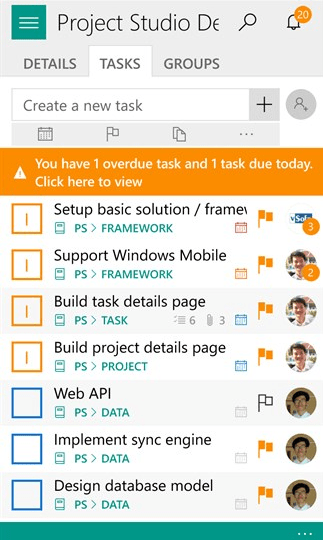 I have tried a multitude of Task apps over the years, many trying to do double duty as a project management app. But none really got even half of it right. 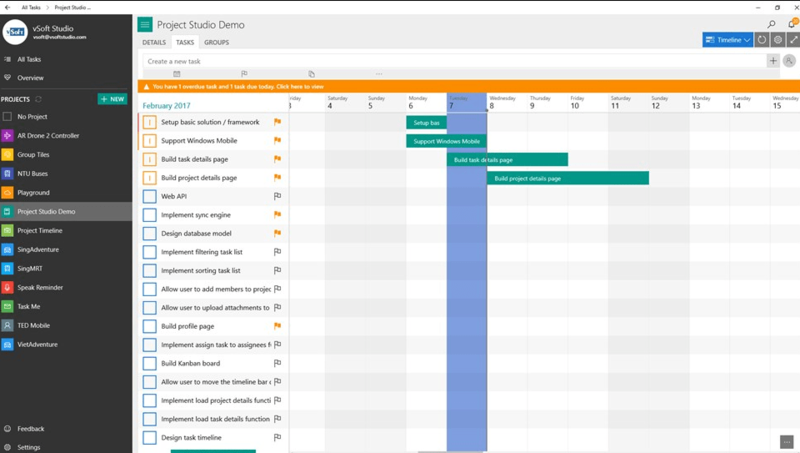 Project Studio is as close as you are going to get to a professional project management app for next to free. 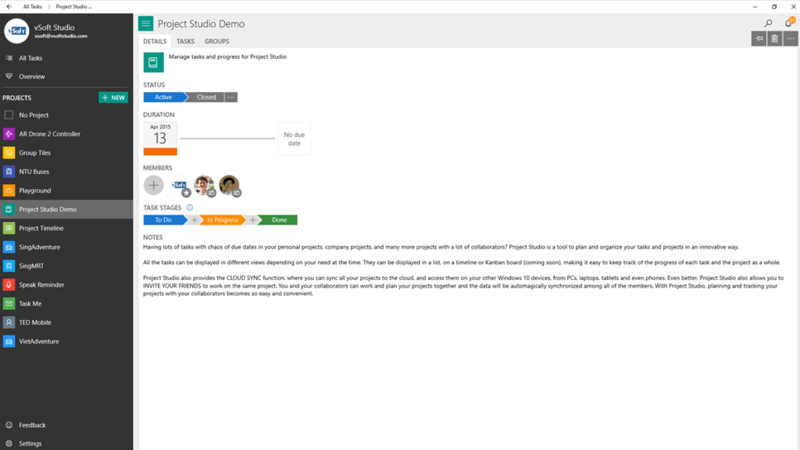 After downloading Project Studio, you will be prompted to create a vSoft account, so the info you enter in the app will be synced to the vSoft server. It’s important to note that this app does not rely on your Microsoft account settings and does not sync with OneDrive. That’s a little troubling to me as we have all seen best intentioned Microsoft Store apps disappear, most recently Package Tracker, because revenue couldn’t support the cost of Cloud Server storage. But I am hopeful that this app will rise above the rest and find a place on many Windows desktops (and possibly a couple Windows phones). Settings are fairly sparse. You can choose between two views for your Home screen and change the Sync Interval between 1 or 5 minutes. Each time the app syncs, you will see a little circle arrow appear next to the Projects list. You can also toggle logging on/off, I suppose for troubleshooting bugs. The sidebar of the app shows; All Tasks, Overview, and a list of current Projects. All Tasks will show, well, all of the tasks created for the projects you have created, or those where your are a member. Overview will give you a view of all your current projects, showing current status and how many open tasks remain for each. Creating a New project is as simple as entering a title, some additional optional details, and a planned start and end date. 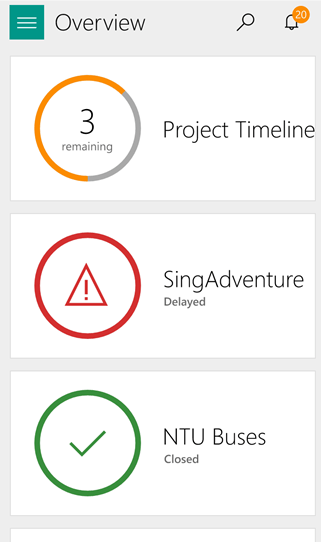 You can also create stages for the project, which will allow you to move tasks along. Each project is setup with To Do & Done by default. A task will change to Done automatically when completed, but the stages between To Do and Done, need to be flagged manually. I have added Assign Tasks to my projects for example. The app also provides plenty of space for additional notes. Finally, you can add members to each project from this screen. More on that later. Creating tasks are as simple as typing a line of instruction and clicking Save. 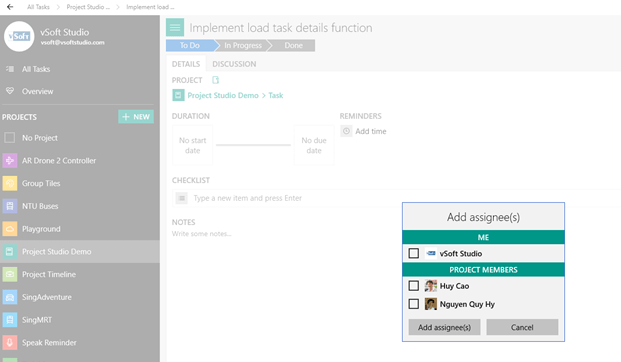 Before clicking Save though, you can set; Start, Due or Duration, flag the task as Important, select which Project to assign the task to (the current project is the default), and assign a Group. I am still trying to understand how Groups are intended to work. 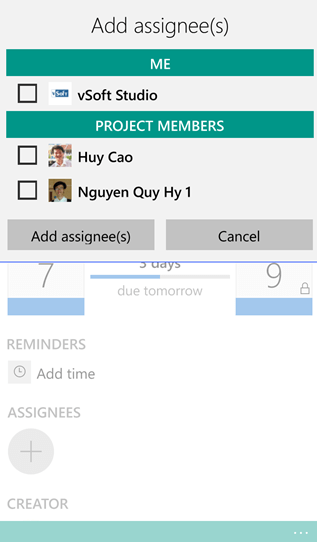 It appears you can add individuals you have invited to join a project to a specific Group and then assign that Group to a task. But the individual task still has individual assignees. So I believe Groups is more for filtering tasks, rather than setting responsibilities. You also have an option to add more details, which includes; adding time reminders, adding a checklist or steps to complete a particular task, and again a generous space to add additional notes. Or, like me, you may choose to enter all of your tasks first, one right behind the other. And then go back later to fill in the details for each, creating your timeline along the way. 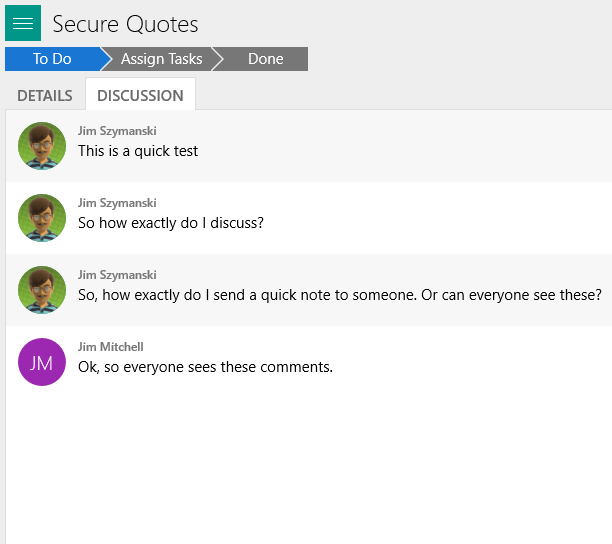 As a part of the detail view for a task, there is an tab labeled Discussion. I had to create another user, an alias I sometimes use with a different vSoft login, to see how this works. A user can enter a comment or question in a discussion, and each minute it will sync with all the users assigned to that specific task. Users are alerted with the Notification icon in the upper right of the app, as well as a notification in Action Center. A user can then write a comment/reply and that will sync back to everyone else. Sort of like a message board for each individual task. Pretty intense. Tags can be added which can be used for filtering your tasks. Finally, you can add attachments to each task. As these are not stored on vSoft servers, you can only add attachments from/to OneDrive and Dropbox. Before you can use this feature you will be prompted to login to your OneDrive or Dropbox account. The options available are; Upload File, From Camera & From Clipboard, which will copy/save the associated file to your OneDrive/Dropbox account. Or Link Existing File, which will link a file from OneDrive/Dropbox. Clicking a file, a Word or PDF file in OneDrive for example, will open a OneDrive viewer or the Word Online app. You can view in a window or expand full screen. Or click Open to open the file in your browser, with the option to Download. 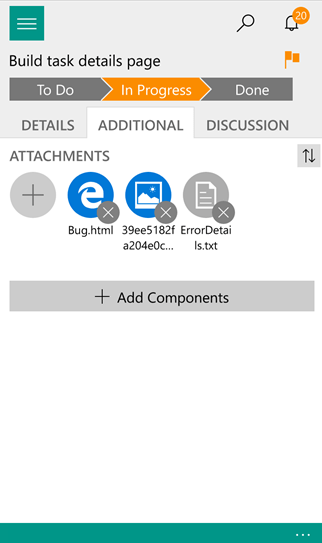 When another users opens a task with attachments you have linked, they will be prompted to login to OneDrive (if you created the links from OneDrive), but they will be logging into their own OneDrive account. 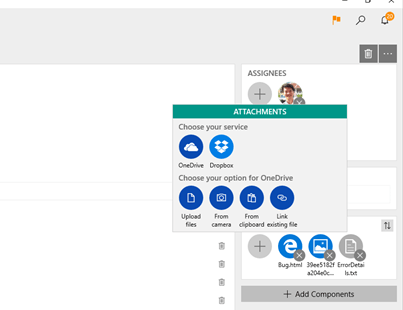 The logging in simply allows the Office Online Viewers to run from OneDrive, displaying the attached/linked files. The summary view of all your tasks will be sorted bottom up by default, but there is a myriad of options available. 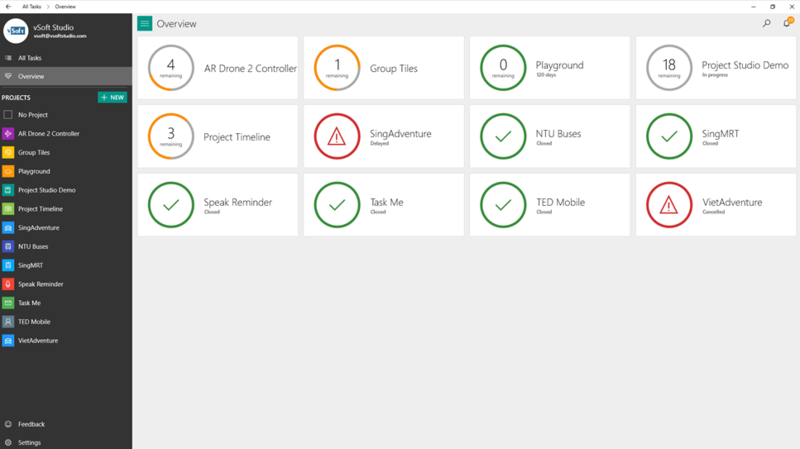 For example, you can choose to display; Priority, Stage, Date Status, Project & Group, Assignees and Tags for all tasks. 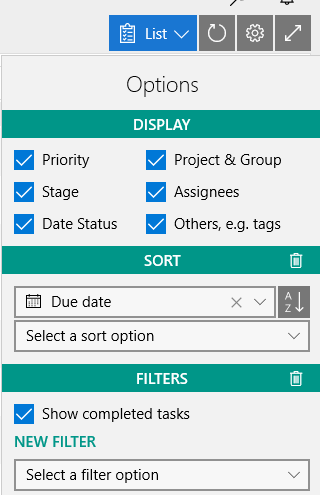 You can also sort by (ascending or descending); Due Date, Start Date, Task Stage, Assignee, Project & Group, Priority and Description. There is also an extensive list of filters by; Start or Due Date, Assignee, Project, Priority, with multiple options for each filter. Somewhat overwhelming. Completing a task in summary view is as simple as clicking the checkbox to the left of the task title. From this view you can also switch to Timeline, or Gant chart, view. You can shrink or stretch the view to see more or less of your project. While there are no printing options available via the app, you can export the project to an Excel file, which creates a well formatted spreadsheet with all the relevant data. All you will ever need for the conference room and the computer non believers. 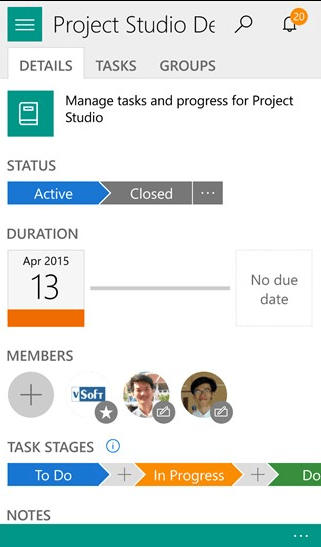 After creating a project you can invite/add additional members. The FREE version of Project Studio will allow for two free members to share a project. To add more members to a project though, they would have to opt in to a Premium membership; $2.99 for 3 months, or $9.99 for a full year. So a Premium member could add two free members to a project. Got it? The full year was on sale yesterday for $6.99, but not sure how long that will last. Well worth the cost for me though either way. When you invite a user to join a project, they are prompted via email to either download the app, or to login to their vSoft account. The vSoft website is nothing more than a login credentials portal for adding a thumbnail photo, changing your full name or changing your login password. There is no online version of this application. You need the app on your Windows 10 PC or Windows Phone to access any data. When you share a project you can choose to give the user read only or read/write permissions. I have loaded the app on two desktops, and two of my 2 in 1s. On my Lenovo Book, I logged in as the aforementioned alias above to see how discussions and assignments work. I also loaded the app on my Lumia 950 and it looks just fine. Not sure if the functionality is exactly the same, but I don’t expect to be developing a complex project on my phone. I should add that the app looks beautiful. Everything about it is inviting. One little niggle of mine is that the Save button is far off the the right of the screen. So there is a lot of mouse movement with most all the other actions occurring on the left, or left/middle of the screen. If you forget to click Save though a popup will appear reminding you to Save or Discard your changes. There are a few quick tutorials which will come up the first time you create a project or task (you can reset these in settings to see them again). But I do wish the tutorials were a bit more extensive and covered a few more features, like those darn Groups. Overall though, this app is a winner. It’s getting a five star review from me today. I will compile a list of little suggestions for the developer over the next couple weeks. But if it never gets updated, it’s perfectly fine as it is right now. Really. You can find Project Studio in the Windows 10 or Windows Phone Store.